Wow, wow, wow, wow! I honestly can not say enough good things about this book! I haven't read a book by Shalini Boland before but I can honestly say all of her books are now on my TBR. The way she writes the story had me on the edge of my story from the very first page from the very end. I can not wait to read more from her. The novel primarily follows Gemma as her life inexplicably seems to fall apart. You spend the whole novel trying to figure out why and who is doing it. Its one twist after another and you really never get a hand of who really is to blame. I was constantly thinking it was one person and then another who was to blame for everything going on. I loved every moment of the book. Because of the constant questions this book was very hard to put down which caused a couple of late nights for me, that I of course do not regret for a single second! I would recommend this book to ANYONE who loves a good psychological thriller. It was absolutely a 5 star read for me. Absolutely fabulous thriller from Shalini Boland. 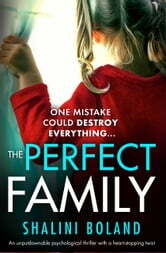 Having read Silent Sister I was keen to read The Perfect Family. I was not disappointed - far from it. The plot was great, and the ending superb. Highly recommend both the book, and the Author. Wow, just wow. Very addictive. Shalini Boland writes brilliant thrillers. Finished this in just under two days. So good I didn't want it to end. Wow, I knew this would be another great read by Author Shalini Boland and I was certainly not disappointed. What a page turner this book was! Robert and Gemma both have great careers and two beautiful daughters Eva and Katie. With their very busy careers, they hire a nanny recommended by Robert's mother, Diane. Lots of twists and turns and an ending I did not expect, or suspect. If you love a good psychological thriller, this is the book for you. Thank you NetGalley and Bookouture for the ARC of this fabulous book in exchange for an honest review.